Gel Ball Hand Exerciser For Strengthening Grip. 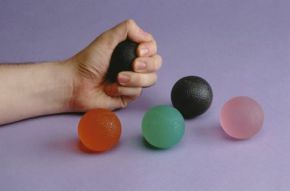 These Gel ball hand exercisers are colour coded to provide variable resistance training for hands, fingers and forearms. The balls are pleasant to touch and return back to their original shape after each squeeze. Perfect for use in the clinic or at home. Set of 5 (one of each colour) available. Excellent product. Very happy with it. Would recommend it.